For more than 100 years, the Indianapolis Motor Speedway has prided itself as the home of the “greatest spectacle in racing.” Since 1911, the IMS has brought energy and excitement to the month of May in Indianapolis and transformed Memorial Day weekends into a veritable Hoosier holiday. Now, more than a century later, the IMS has entered a new era of fun and spectacle. 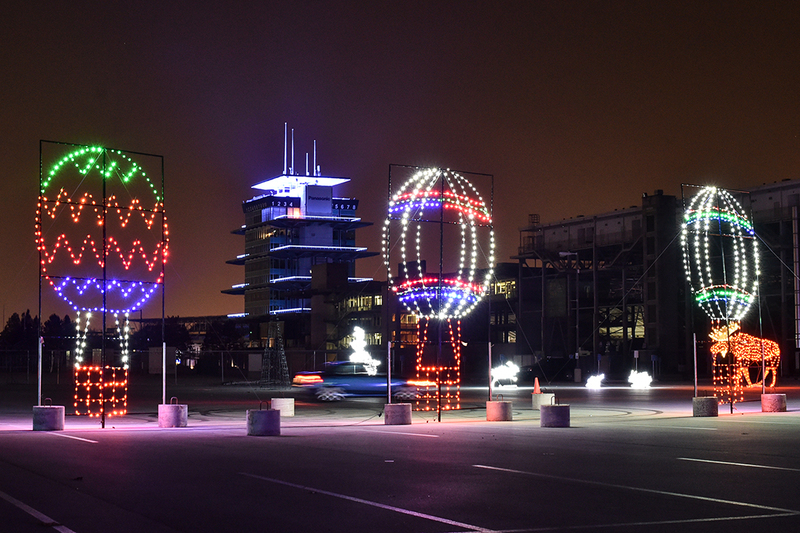 The Lights at the Brickyard has introduced Christmas holiday magic with an Indy 500 flavor. This drive-thru holiday experience, which is now in its third year, features displays on a 2-mile course that takes visitors through the infield, around historic oval and across the Yard of Bricks start/finish line. “Basically, we were looking back through things and at the fact that before 1994, the track was completely closed after May,” said IMS President Doug Boles, and a Zionsville resident. “We wanted to find a way to utilize the track beyond May and August but maintain the family atmosphere. This was a nice way to introduce folks to the track who had never been. This year, Boles is particularly proud of a new feature which allows visitors an out-of-car experience. “Visitors will have an opportunity to get out of their cars this year and look at the museum and have hot chocolate,” he said. “There will also be a special Santa night on Dec, 9. Families will get to visit with Santa and have pictures taken with him. At the end of the day, this is really our way of showing our appreciation to the community. We at the IMS are very grateful and really blessed to have the support of the community. Lights at the Brickyard runs through Dec. 30. For information on times and tickets, visit IMS.com.